It was in 1831 that the first meetings for the actual formation of a parish in Northern Liberties and Kensington were held. It was in July of the year before that "the theologian of Bardstown," Francis Patrick Kenrick, consecrated titular Bishop of Arath and appointed Coadjutor to the Bishop of Philadelphia with the right of succession, had arrived in the City to take up his duties. His first concern had been, for he was really administrator, to see where the nuclei of Catholics would warrant the establishment of new parishes. This year, 1831, closed a sesquicentennial from the foundation of Penn's Colony. The boundaries of the City then were South Street (Cedar), Vine Street, and the two rivers. In these one hundred and fifty years it had grown enormously, from 500 in 1693 to about 40,000 in 1793; and with the constant inpouring of immigrants the population had increased by 1831, notwithstanding the dreadful decimation wrought by the recurring epidemics of yellow fever, to 80,477. The area south, particularly Southwark, was well built up, and many thousands lived above the northern boundary, most of them in the Northern Liberties and Penntownship. Let us take a glance, that we may understand our story better, at the history of Catholicity in Philadelphia before the establishment of St. Michael's Parish. The Jesuits laid the foundation of the Philadelphia Church. As early as almost a decade before Penn came to America, when there were only Dutch and Swedish settlements along the Delaware, one of the order, Father Pierron, passed through this territory on a missionary journey from Quebec; but it is hardly likely that he found any of the Faith here. But before the end of the century at least one priest was coming here occasionally to minister to the few Catholics; it was Father Thomas Harvey of New York, who like many other English Jesuits of the time had found it necessary to take an alias, and was known as Father Smith, or merely John Smith. After the order established St. Xavier's Mission House at what is called Bohemia Manor in 1706, priests came from there at frequent and rather regular intervals to say Mass and administer the sacraments. In 1720 Philadelphia was assigned to Father Joseph Greaton as part of his charge in the Maryland missions. For some years he said Mass, as the missionaries before him had done, in private houses, which therefore came to be known as chapels. There is a tradition that such a chapel was at the northeast corner of Front and Walnut Streets, and there is evidence that another was on Chestnut Street where No. 134 is today. When the boundary dispute between Maryland and Pennsylvania had been settled and there was no longer fear of being subject to the anti-Catholic laws of the province in which religious liberty had been accorded by the Catholic founder and where an apostate now ruled as proprietary. Father Greaton purchased a lot beside the Quaker Alms House and had a chapel erected, which he called St. Joseph's - now known affectionately and reverently as "Old St. Joseph's." It was the first public Catholic chapel in British America. This was just one hundred years before the dedication of St. Michael's Church. He was the first of a line of Jesuit pastors of Philadelphia. Fathers Harding, Molyneux, Beeston, and Leonard Neale succeeded in the order of their names. They were saintly men and indefatigable workers, all of them; and they won the respect and admiration of the fair-minded element in the non-Catholic population. They had worthy assistants, too, Jesuits, Capuchins, Dominicans, and secular priests. Father Harding had St. Mary's built as the parish church, for the chapel had been found too small to accommodate the steadily increasing number of Sunday worshippers. Twenty-six years later, that is in 1789, in Father Molyneux's time, the Germans of the City obtained a charter and built their own church, Holy Trinity, to which however a Capuchin pastor was elected. Father Leonard Neale (afterwards Archbishop of Baltimore) left St. Mary's in 1799 to assume the presidency of Georgetown College, and the Jesuits did not return to a permanent charge in the City of Philadelphia until 1833, when they took over St. Joseph's from Father Terence Donaghoe, and he was appointed to the new parish in Kensington. These thirty-four years between the departure of the Jesuits and their return have written glorious pages and pages of shame in the history of Catholicity in this City. The schism at Holy Trinity, which had begun in 1796, continued until January, 1802. The Augustinian, Father Matthew Carr, who succeeded Father Neale at St. Mary's, had already formed St. Augustine's Parish and started the erection of the church; it was completed and dedicated in 1801 - the largest in the City. St. Mary's School, founded years before by Father Molyneux, was made a free school, the germ of a system which has become the admiration of the Catholic world. Similar schools were instituted in a few years at both Holy Trinity and St. Augustine's. The Diocese of Philadelphia was established in 1808, and its first bishop, Michael Egan, a Franciscan, was consecrated at Baltimore in 1810. St. Mary's, where he had already been pastor for seven years, was, of course, his Cathedral. But he died four years after his elevation, worn out by his ministrations during the epidemics and trustee troubles. There followed an interregnum of six years during which the trustees of the Cathedral, a group whose attitude was certainly far removed from the humility of the Irish immigrants, sought to increase lay influence. Because of this trouble several nominees refused the bishopric. The administrator. Father de Barth, was beset with many difficulties and vexations, and in his harassed state of mind accepted a certain Father Hogan, who presented himself without proper credentials and was engaged to assist at St. Mary's in the spring of 1820. At the end of this year Philadelphia's second bishop, Henry Conwell, who had been Vicar General of Armagh, arrived. He had been here only a week when he found it necessary to suspend Father Hogan for immorality and insubordination. The trustees sided with the priest, forced the bishop out, and for six years St. Mary’s were a schismatic church. Some prominent families left the Church, never to return, and the affair was a scandal to the whole country. Bishop Conwell sacrificed himself to end this Hogan Schism, for he signed an agreement which he knew would be condemned, because the trustees had pledged themselves to abide by the decision of the Holy See. Consequently he was summoned to Rome for interrogation, then forbidden to depart, apparently under a cloud. He was a very old man now, nearly eighty, forgetful and impatient, and he left without permission in order to attend the Council which was to be held at Baltimore. He was permitted afterwards to return to his diocese. But Francis Patrick Kenrick was appointed coadjutor with full powers of administration - the learned, energetic, pious, cautious but fearless, Kenrick. Almost immediately he created two new parishes, St. John the Evangelist's, and St. John the Baptist's in Manayunk. Then he turned his eyes to Kensington and the Northern Liberties. The Catholics of Philadelphia should always have a kindly and grateful attitude towards the Quakers for their determined resistance to the spirit of intolerance, which in the early days held sway through all the British world outside Penn's colony, and even contested their fairness within. Penn himself had felt the sting and pinch of the intolerant English laws, and had conceived his project in a spirit of rebellion against such persecution. He made it a fundamental law of the Province that its inhabitants "shall in no way be molested or prejudiced in their religious persuasion or practice or in matters of faith or worship." It was a "holy experiment" in religious liberty in an age when the British flag had become a standard of religious hatred. He had obtained his liberal charter from Charles II, who was inclined to Catholicism but too politic to show it very clearly. He had no fear of opposition at home during the three years of the reign of James II, who by a "violent and unconstitutional exercise of royal authority" tried to bring England back to the Faith. But the bitterness against Catholics was intensified even in the colonies, and with the accession of William and Mary it required great courage to continue to uphold the law of religious freedom. In the neighboring Province of Maryland the Catholic government of Charles Calvert was overthrown and persecution begun. In Rhode Island, the only other colony in which liberty of conscience had been proclaimed, there was scarcely a Catholic; but repressive laws were soon passed as a precautionary measure. The members of the established Church now began to harass Penn. They appealed to the English authorities, making the complaint that his government suffered "public Mass in a scandalous manner." The bigots in the other colonies were stirred to frothing indignation at the asylum still open to Catholics. One minister of Burlington, N. J., wrote to a London publication that Penn was a "greater anti-Christ than Julian the Apostate" because he "labors to make Christians heathens, and proclaims liberty and privilege to all that believe in One God" - a truly remarkable indictment! He was accused of being a Jesuit in disguise, which accusation, remarks Miss Repplier, might have been spared a man who had had two wives and five children. Later, in 1734, the movements to force withdrawal of the freedom accorded Catholics had made such headway that it was necessary to hold a Town Council to debate the matter. The Episcopalians argued that the clauses in Penn's Charter upon which the "papists" based their claim to worship openly, were inconsistent with the Law of England, and hence null and void. The Council considered the argument, and then in another session determined to leave it to the discretion of the governor whether or not he would consult his superiors at home; and he very wisely did nothing at all about it. Presbyterian influence was growing stronger every year. There was a tremendous exodus from Ireland in the eighteenth century; in the first half about two hundred thousand Irish entered the colonies, most of them Presbyterians. Many of these settled in and about Philadelphia, and they joined with the Episcopalians in hostility to the Catholics and in opposition to Quaker supremacy. During England's war with Spain and at the beginning of trouble with France bigotry became seriously threatening. The whole Province was excited over the possibility of invasion, and Catholics were accused of treasonable inclinations simply because of their common religion with the enemy. Demagogues and the newspapers fanned the flame; it is interesting to note that Benjamin Franklin through his paper, the Gazette, and in a pamphlet, stooped to low attacks against the Church. Then in 1746 along came Rev. George Whitefield and served vitriolic denunciations of "popery" to immense throngs. But through all this excitement the Quakers stood firm in their protection of Catholics. Once they prevailed upon a mob of fanatical Presbyterians armed with axes, who had come to destroy St. Joseph's Chapel, and made them disperse. Years later, in 1755, when the fury was let loose anew after General Braddock's defeat by the French and Indians, and another mob gathered to destroy the "Mass House," they again intervened and insisted that "Catholics as well as Christians of other denominations were settled upon the faith of the Constitution or William Penn's Charter and that the Government was bound to protect them, so long at least as they remained inoffensive and paid dutiful regard to the Establishment." Their supremacy, however, was tottering, as much because of their fair attitude towards Catholics as their opposition to armed defense, and in this year, 1755, the Assembly passed an anti-Catholic bill in spite of them - the Military Act, which was rejected by the king because of a provision in nowise relating to religion. The period went by with no serious harm done. But the virus was now in the very veins of Philadelphia and towards the middle of the next century it would cause a fever of hatred, before the delirium of which would have passed, St. Augustine's and St. Michael's would be destroyed. A very different picture of the Quakers is given by a writer in the Woodstock letters. He accuses them of making a public pretense of philanthropy and benevolence, but in private freely indulging a loathing of Catholics. But it is scarcely credible that the Quakers in general, of the time to which the writer refers or any other, were so different in private from their public character. As long as their influence was dominant Catholics had a sense of security. The defense and protection they gave cost them not a little. They were very kind and generous to the poor, starving exiles from Acadia. Individuals here and there may have succumbed to the intolerant spirit about them, but from the beginning the body has been characterized by gentleness and fairness. Nor is it to be thought that all the other non-Catholics of any period have been bitter towards the Church; there have always been many well disposed. The Episcopalian antagonism lessened as the years of the nineteenth century went by, and in 1829 when the news was brought to Philadelphia of the passing of the Catholic Relief Bill, the bell of Christ Church in which seventy-four years before the Rev. Mr. Reading had poured out his violent and inflammatory utterances against "papists" and "popery", as well as the old State House bell, was rung "in testimony of joy at the recent triumph of religious liberty in Ireland." Through it all, the periods of calm, the periods of unleashed fanaticism, the periods of rebellion on the part of groups within, the Catholic body went on growing steadily. When the comer-stone of St. Michael's Church was laid there were already forty-seven churches and twelve stations, attended by forty priests, in the diocese, which then embraced all of Pennsylvania, Delaware (which up until the Declaration of Independence had been little more than a part of Pennsylvania), and the southern and western parts of New Jersey - the territory which had formerly been the care of the missionaries of St. Joseph's. In Father Harding's time it had had scarcely three thousand Catholic inhabitants; now there was a Catholic population of more than seventy-five thousand. St. Michael's Parish was to be incorporated as "The Trustees of St. Michael's Church of Kensington and the Northern Liberties." It was to consist mainly of the Catholics of these two districts. In order, then, to have what might be called the ‘compositio loci’ for our story, it will be necessary to know something about them, something of their origin and development, particularly of western Kensington, to which in the course of Catholic growth the parish territory became restricted. As the original City was too small - having only about twelve hundred acres - to accommodate the colonists who on the strength of Penn's prospectus sought large pieces of ground in it, the land north and west was divided into lots and given to these "first purchasers" to make up full value for their money. On Holmes’s Map of the Province of Pennsylvania it is seen that this free land, or "Liberty Land," extended northward beyond the Falls of the Schuylkill; westward to Mill Creek; and northeastward as far as Frankford Creek. One must except, of course, the Proprietor's Manor of Springettsbury, which originally contained eighteen hundred and thirty acres, running from Vine Street almost as far as what is now Girard Avenue, and from river to river. The Liberty Land west of the Schuylkill came to be designated as the Western Liberties, and the land east as the Northern Liberties. Time, of course, brought changes. Springettsbury was sold piece by piece. The Northern Liberties narrowed down to a township whose lines were Vine Street, the Delaware to Point-no-Point, Frankford Creek, Wingohocking Creek to Nicetown, Germantown Road, Sixth Street. Out beyond Kensington some small settlements sprang up in this area: Richmond, Harrowgate, Fairview, and others. But the lower section, the section which in the beginning of Philadelphia history had been part of the Manor, was built up rapidly - so also was Kensington, but we shall turn to that in a moment. This lower part adjoining the City was given some measure of separate government as early as 1791. In 1803 it was incorporated by the Legislature as a district with Cohocksink Creek (Canal Street) as its northern boundary. So the Northern Liberties came to designate both a district and a township - nearly always when the name is used without further determination in this story it is the district that is meant. The population of the district at the time of incorporation was approximately ten thousand; in 1830 it was about twice that number. There was a Catholic family here and there. It is scarcely pertinent to our story to say anything more about the history of this section. In general it was simply the rapid outgrowth from the City. I wish merely to remark, in passing, a few interesting things: that the first Philadelphia free school was established here in 1787; that the Second Street Market House, running in the middle of Second Street from Poplar to Fairmount Avenue, still standing and doing some business, familiar to most Philadelphians, for nearly everyone sometime or other rides down Second Street, was begun in 1794 and the profit from its operation was to go to the support of the charity school for the poor; that the industrial expansion of the City was wonderfully evidenced here - at the time of the founding of St. Michael's there were iron works, copper and brass and tin factories, fabric and paper mills, chemical laboratories, carriage shops, potteries, distilleries, breweries, and many other industrial establishments; that in 1831 it had many churches – one Episcopalian, three Methodist, two Presbyterian, one Universalist, two German Reformed and two Baptist. Up above, Kensington progressed with rivaling strides. Whence came the name? It was given by Anthony Palmer, probably with good-natured irony, probably in a spirit of wistfulness or hopefulness. In 1730 he purchased a tract of ground along the Delaware, a hundred and ninety-one and a half acres, extending on the river from what is now Hanover Street to Gunner's Run, and laid out a town. It was simply a little fishing village in the beginning. Herring were caught in abundance and smoke-houses were built along the shore; hence it was soon styled Fishtown (a popular name which clings to this neighborhood even today) and the ambitious title was reserved for formal use. Well, the years went by and the fishing gave way to ship building. Kensington thrived, it spread out, like a rising tide it extended itself till it met and merged with the overflow from the City. Mills and factories of nearly every description came here, the beginning of the industrial growth which was to make it famous. There were great shipyards building for the coasting service and foreign trade. Some of them received orders from foreign governments. There were Ayres' and Vaughn's and Donaldson's, and Bower and Vandusen's, and others; the last-named firm before 1830 built a fleet of gunboats for the Colombia Government. The first Philadelphia-made locomotive was constructed in Kensington by Col. Stephen H. Long in 1831. It had become an incorporated district in 1820, Canal Street being the dividing line from the Northern Liberties, and Germantown Road and Sixth Street marking it off from Penntownship. It must have had then a population of seven thousand; in 1830 it had about sixteen thousand inhabitants. There had been some Catholics in this section at an early date. According to the register of St. Joseph's Church, Father Farmer baptized a child here in 1778, a John Rittisheim; and again in 1780, a Mary Magdalen Abt. No doubt there were just a few isolated families. It is possible, but not likely, that much further back a Catholic or two of the northern part of the Kensington area had gone to Mass occasionally at Dr. Michael Brown's home on Nicetown Lane or at the "Chapel." But it would seem to have been much easier to attend the City Church. After St. Augustine's was built the growing Catholic group went there regularly. The Irish, Catholics and Protestants alike, were drawn towards Kensington because of the growth in this locality of the textile industry - for its steel and iron business Kensington has become noted, but much more for its manufactories of textile fabrics of every kind. These Irish were familiar with weaving, they knew, most of them, how to operate hand-looms. A Catholic colony formed in the neighborhood of Second and Jefferson Streets, and it was constantly augmented as immigrants poured into the City. Most of the wage-earners, then, were weavers; some worked in the mills, but the greater number had looms in their own homes - or usually in little workshops in the rear of their homes. Our interest, of course, attaches in greatest degree to this neighborhood of the present parish, and I wish to say a little about how it looked at the beginning of the story. There were not many houses west of Germantown Road, and west of Sixth Street, that is in Penntownship, farm lands stretched away. Between Fifth (then called Old York Road - this and Frankford Road were the two great highways New York-ward) and Sixth, flowed Cohocksink Creek, which spread out into a small lake called the Mill Dam at Master's Street. From the pond a rivulet wound westward, but the main flow, the continuation of the creek, was southeastward to the river, and was generally referred to as Canal Street. Above Montgomery there were only farm lands. Almost up to this northern limit and from Germantown Road east the area was well populated, rather well covered with buildings. Phoenix. Columbia Avenue was called Camac Street; it began at Washington Street and ran westward, a mere narrow dirt road for the most part, as far as our present Eighth Street, then slanted north-westward and became Camac Lane. Mascher was then Clinton. Indeed just a little before the foundation of St. Michael's, Jefferson Street had been called Bond Street; and Montgomery, Mud Lane. It seems that at one time there was thought of making this western section of Kensington a separate town or district under the name of New Amsterdam. As late as 1835, when an advertisement appeared in the U. S. Gazette that St. Michael's Church was to be sold by the sheriff, it was described as St. Michael's Church "on the plan of the New Amsterdam." As our Catholic group became noticeable, the hard, bitter religious temper of the inhabitants of the old Kensington expressed itself. They conceived and manifested a hatred and contempt of the western section as a "place infested with foreigners" - that is, of course, with Irish Catholics. 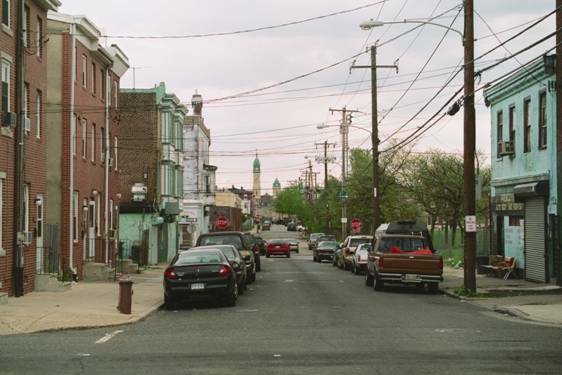 Our people did not predominate here then, would not for many, many years, but the presence of a large number of them vilified the neighborhood in the eyes of the intolerant denizens beyond Frankford Road and Shackamaxon Street. East of that line there was not a Catholic family; no one would think of selling or renting to one of our Faith. In truth, a Catholic would scarcely dare to venture beyond that line, into that district pervaded with a bleak, bitter Protestantism. The people of Fishtown have been described as "a sturdy, reliable set." They seem to have been such, but undoubtedly they had their weaknesses too. They were of the type who would be most rigorous in the practice of their pet virtues and most free from compunction in the indulgence of their pet vices. They aimed at a high respectability, they had a smug self-satisfaction, an abiding consciousness of "righteousness" - which is the surest sign that one is worlds away from the truly Christian spirit. Yet they called themselves Christians, and went to church regularly: some, to the Union Wesleyan Church on Queen Street; others, to the Kensington Methodist Church at Queen and Marlborough; and the rest, to the Kensington Presbyterian Church on Palmer Street. It has been said of them, too, that they were "staunch in their Americanism." We have heard that said often of intolerant Protestant communities, have we not? In fact it has been repeated so often of intolerant Protestant communities that the thought was rather general for a while that intolerant Protestantism was an essential of true Americanism. We know that it is not; we know that it is utterly foreign to the letter and spirit of the Constitution, to that great, noble idea which in the Providence of God has molded our institutions and shaped our course as a nation. The bigotry of the Fishtowners must have been a strong, silent passion through the years - unprovoked, unchallenged. Now at sight of the growing Catholic colony nearby it burst forth angrily. But the Irish Catholics were accustomed to hostility, even to persecution. They were not worrying about the fanatics of Fishtown, they were thinking how good and wonderful a thing it would be to have a church of their own, a pastor whose one flock they would be.